Setting up the 'Time-Sheet Auto Approve Rule' allows you to automate the Time-Sheet approval process. You can setup the rule by navigating to 'Time-clock' module and click'Auto Approve Time-sheet Rules'. By moving the 'Slide Bars' towards the right, you increase the Minimum and Maximum 'TimeSheet' length the 'Auto approve rule' will observe to approve the corresponding Time-sheets automatically. 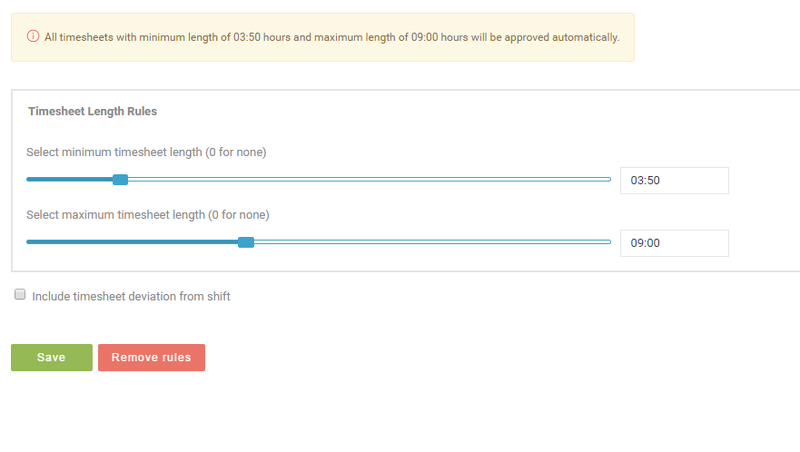 This rule requires a corresponding shift to auto-approve the TimeSheet against that shift. This rule ensures that, if an employee has clocked in and clocked out according to his scheduled timings, then his TimeSheet can be auto approved. Note: Having no shift for the date of 'TimeSheet' entry will void the rule. 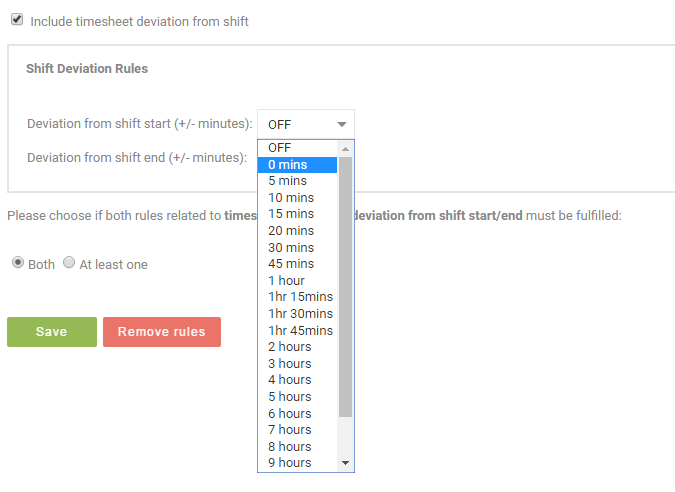 The Values which we set under (Deviation from shift start +/- and Deviation from shift end +/-) allow you to set up the least acceptable Time deviation. Shift Deviation rules cover both the cases i.e. if you want theTimeSheets which were accurately recorded against the Shift Times to be auto approved then set '0/Off' from the drop down menu. Similarly, if you want the TimeSheet which deviates 15 minutes (+/-) from the actual shift time to be auto approved then select 15 Mins from the drop down menu. From the Bottom of the page, you can select whether you want only One rule to be followed for auto approval or you want both the rules to be followed for the auto approval to work. Selecting Both means: The time sheet must obey both the rules which are set under 'TimeSheet length rules and Shift deviation rules' to get auto-approved. And you set the Maximum TimeSheet length to '9' hours. Then the TimeSheet added from 6 am - 3 Pm = 9 hours will be auto approved because it obeys the maximum limit set under 'maximum shift length rule' + the TimeSheet deviations remains inside the allowed threshold under the 'Shift Deviation rule'. But the Time sheet added from 6 am - 4 pm= 10 hours, won't be auto approved, though it obeys the threshold for time deviation under 'Shift Deviation rules' but it does not satisfy the maximum shift length limit under 'TimeSheet length rules'. Selecting 'At least one': Satisfying any 'One' out of the set rules under 'Maximum shift-length' and 'Shift deviation rule' will endorse the TimeSheet for auto approval.